Thanks to all who attended the webcast. We hope that Martyn’s insights about maximizing the ROI of virtual training will help you and others in your organization to enhance the effectiveness of your web-based training programs. Click to download a copy of Martyn's presentation deck for "The Case for Live Virtual Training: Weighing the Alternatives and Maximizing Your ROI." Click to watch the archive recording of the webcast on the Citrix Online website. 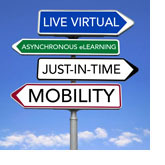 In this webcast presented by Citrix Online, you'll hear from Martyn Lewis—Principal and Founder of 3GS and a respected thought leader on live virtual training—as he delves into the hot topic of what it takes to maximize the ROI of virtual training. Pushing beyond the usual discussion of travel-related cost savings and convenience, Martyn discusses the deeper issues that can make or break the success of any training program—whether physical or virtual—in today’s technology-enabled world.